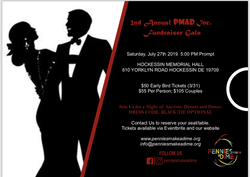 Join us for your 2nd Annual Pennies Make A Dime Inc, fundraiser gala on July 27, 2019, 5pm at Hockessin Memorial Hall. 610 Yorklyn Road, Hockessin, De 19702. The theme for this years's gala is "Hope Alive. ​Our gala is to raise $10,000 benefitting Pennies Make A Dime Inc. for development program as such Scholarship, infrastructure(shelter) and healthcare. We believe every money raised/ donated will make a difference in a child's life, therefore on Saturday, July 27, 2019, any amount contributed will be greatly appreciated in reaching our goal. Tickets are on sale now via Eventbrite, our website www.penniesmakeadime.org or contact our sales reps at 718 696 7461. Early bird tickets $50, Individual ticket $55 and couples $105. There will be a auction, raffles, networking, and lots of entertainment. 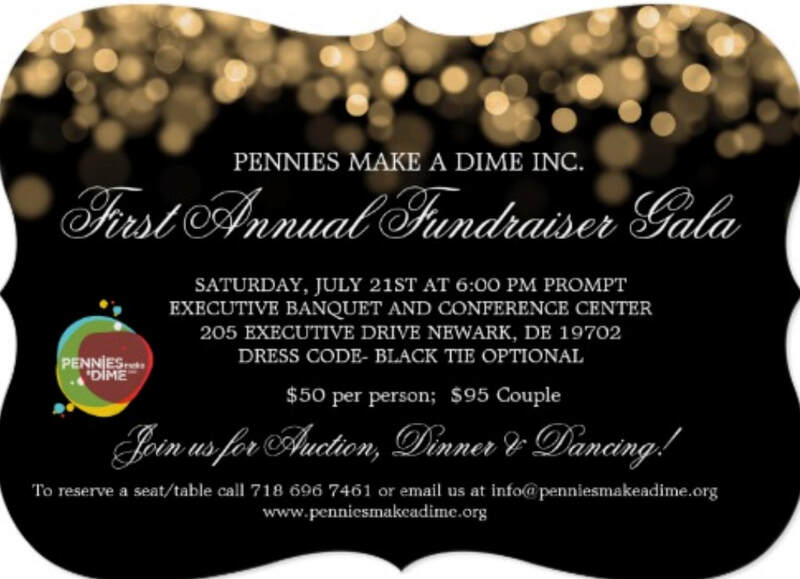 Pennies Make a Dime Inc is a 501(c)3 nonprofit organization. All contributions to the foundation are tax-deductible. The 4th annual match for a cause is sponsored by Boathausstudio. The idea behind this event is to fundraise fund for children affected with cancer in Africa. Saturday October 14, 2017,onsite registration will start at 10am, Games starts at 11am. Games will be played using intramural Outdoor soccer rule (7 vs. 7 including Goalie). Teams consist of minimum of seven including goalie. we welcome co-ed teams as well as female. The cost to play will be $35 per player (cash or check or Credit Card is acceptable). Registration is open online via eventbrtie,company website or on site. There will be prizes awarded to winning team. Tournament will be held outdoors at Kirkwood Soccer field- ﻿1220 River Rd, New Castle, DE 19720﻿. Individual registration will be place into a team. 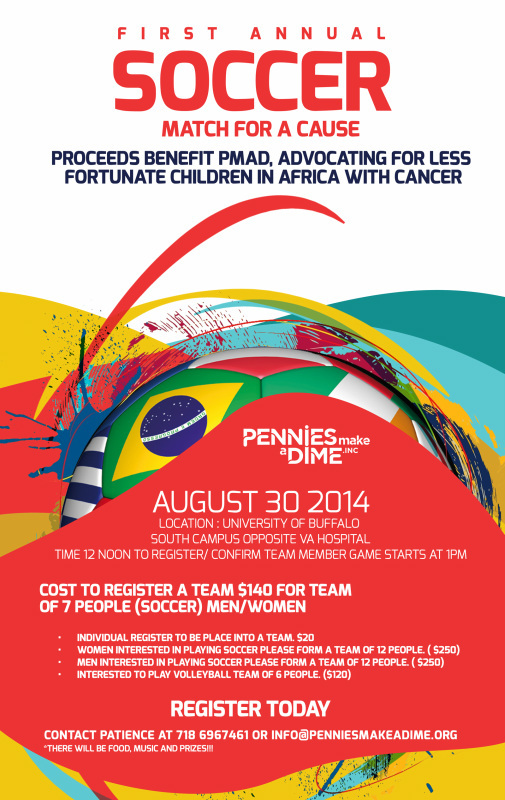 There is a link to attend the event on Facebook and to see who else is attending: Soccer Tournament. The facebook event page will also be updated with the brackets and teams so there is no room for misunderstandings. Teams will be considered on a first come first serve basis, check out our social media- facebook, google hangout, instagram for update. Teams presenting this years soccer tournament includes Chibsah foundation, JP Morgan Corporation, StarBright Team and All Star Team. This year's Tournament was a great success. Congratulations to the Chibsah Foundation for Win. Special thanks to Chibsah Foundation for sponsoring, all volunteer for their services, All the registered Teams and Kirkwood Soccer Club. The First Annual Match for a Cause is sponsored by Boathausstudio. The Soccer Tournament will take place during summer season. Location will vary year by year. The idea was initiated by Patience Roberts, the founder for PMAD Inc. with the goal of getting International and American students, faculty, and staff together in an event that fosters a sense of community and belonging for everyone involved to raise fund for orphans and children in Africa Battling Burkitt Lymphoma cancer. We want this event to be for all of the community willing to participate, and a mixture of educational values and enthusiasm while participating in such a popular event. Saturday August, 30th 2014, site registration will start at 11am, Games will start at 12pm. Games will be played using intramural Outdoor soccer rule (7 vs. 7 including Goalie). Teams will consist of a minimum of five players and a maximum of 7 players ($140 per team). Any team may be co-ed, all male, or all female. We will not have separate brackets for this tournament. The cost to play will be $20 per player (cash or check or Credit Card is acceptable). These registration fees and other donations will be collected by PMAD reps at site to go to a good cause. There will be prizes awarded to the winners. Tournament will be held outdoors at University of Buffalo South Campus opposite VA Hospital. Individual registration will be place into a team. 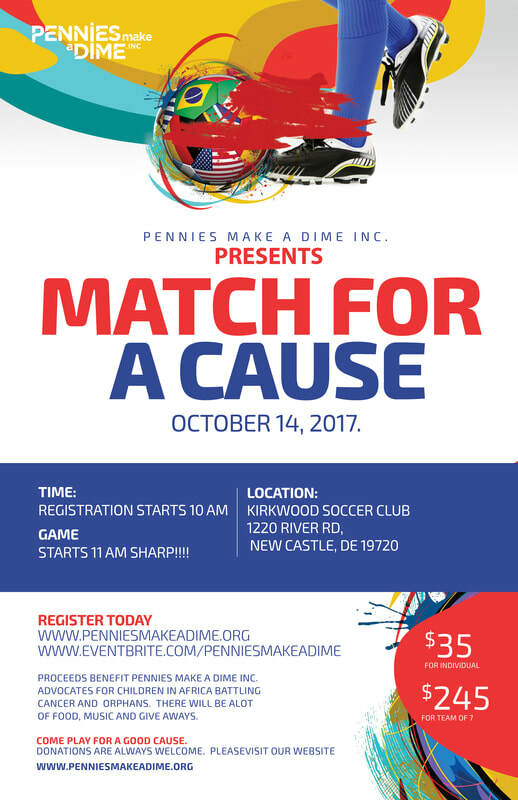 Please submit your forms to www.Penniesmakeadime.org or to the PMAD Reps. The registration form is at the bottom of the page. There is a link to attend the event on Facebook and to see who else is attending: Soccer Tournament. The Facebook Event page will also be updated with the brackets and teams so there is no room for misunderstandings. The names of the Winning Team will be published on your website each year.